This article is about the final boss from Mario & Luigi: Bowser's Inside Story. For the boss from Super Paper Mario, see Shadoo. Not to be confused with Black Bowser. Dark Bowser is Bowser's final boss in Mario & Luigi: Bowser's Inside Story and its Nintendo 3DS remake, Mario & Luigi: Bowser's Inside Story + Bowser Jr.'s Journey. His voice is a slowed-down version of Bowser's and he has all the powers Bowser has, along with many dark variations as well. 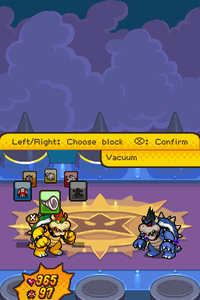 Dark Bowser has a similar appearance to the Fright Jar and Fright Mask items from Paper Mario and Paper Mario: The Thousand-Year Door, only with yellow eyes and a darker palette. When the Dark Star was gathering DNA from the Airway inside Bowser's body, Mario and Luigi tried to stop it before it succeeded. The brothers fought hard to defeat it, but apparently, it had already absorbed every piece of DNA that it needed, and it transformed into Dark Bowser, although in a ghost-like state because he was incomplete. The only parts missing were the legs, which it obtained by inhaling Dark Fawful (he inhaled an unconscious Princess Peach earlier, but nothing happened), thus completing his form, and becoming solid in the process. He flees from Bowser, but when Bowser finds him alongside a still unconscious Peach (who is now inexplicably outside of Dark Bowser) in the secret tower of Peach's Castle, they both execute flame breath attacks that clash with each other, initiating the prologue to the final battle. Bowser overwhelms Dark Bowser, then they both curl up into a spike ball and the fight commences. Bowser again overwhelms his dark form, who gets away. Later, Dark Bowser unleashes a dark hurricane over the Mushroom Kingdom, trapping Broque Monsieur, the Koopa Paratroopa Trio and several Toads and Goombas in bubbles. Bowser is now the only one who can defeat his doppelganger. Once Mario and Luigi defeat the Dark Star Core inside Bowser, Dark Bowser becomes unstable. This allows Bowser to finish him off with a "one KO punch". Dark Bowser then turns into a star that flies above Princess Peach's Castle and explodes, reverting the kingdom back to normal. Dark Bowser has all of the original Bowser's physique and build, but is detailed very differently. All of his scales and shell are colored dark blue, and his snout, stomach, horns and spikes are noticeably paler than Bowser's. His eyes are identical to the Dark Star's own, but seems to entirely lack Bowser's eyebrows. The rings around his spikes and horns are colored black, and the most noticeable difference from Bowser and Dark Bowser is that Dark Bowser has a black mohawk. His sprites also has dark orbs float across his body. In his incomplete state, he retains his details, but appears as a ghostly figure with a purple coloration (without his eyes), whilst pulsating a brighter purple. His animations are also distinctive in that his idle sprite has misplaced pixels to give an effect resembling video noise, and his talking animations have a noticeable jitter to them. He also entirely lacks legs and a tail until he is fully complete. While Dark Bowser is incomplete, his speech is halted and can only speak one sentence at a time. However, upon his completion, he starts to speak fully and does not use contractions. In the Japanese version, his speech is halted and written completely in katakana while he is incomplete. When Dark Bowser inhales Dark Fawful and is completed, he begins to speak in more natural Japanese, with kanji and no pauses. Aside from text dialogue, Dark Bowser's roars and grunts are provided by Kenny James. One of Dark Bowser's attacks is throwing a boulder into the air and blasting it apart with fire, causing rocks to fall from the sky. Bowser must duck with his shell to avoid taking damage. However, he must also punch one of the rocks in front of him at Dark Bowser, who is charging a massive blast of dark fire. When the rock lands in his mouth, the attack's energy recoils and he inflicts damage on himself from the inside. If Bowser does not do this, however, he takes damage from the blast. Dark Bowser breathing fire at Bowser. Another attack involves him punching Bowser repeatedly. Bowser must counter with his own punch, making their fists clash and negating any intended damage. Afterward, Dark Bowser will jump into the air as a spiked ball and try to land on Bowser. Bowser must duck in his shell to protect himself. He can then counterattack by quickly throwing a punch at Dark Bowser after Bowser ducks. Another attack traps Bowser in a cage and raises it into the sky. Dark Bowser will then charge up an energy ball to launch at Bowser. Bowser must try, by punching repeatedly, to destroy the cage's lock before he gets hit by the energy ball (he should have just enough time to do this). He can also swing the cage off its hinges with shell defense to damage Dark Bowser, however, this method takes longer and requires precise timing while swinging. After taking enough damage, Dark Bowser will fall to the ground; he is then fully healed by the ingested Dark Fawful and will grow larger. He will always follow this up (assuming Bowser did not make Dark Bowser's HP fall to 0 via counter-attacking) by tossing a mixed ball of "Dark Minions" at Bowser, including dark versions of Goombas, Koopa Troopa, Thwomps, Bob-ombs, and Bullet Bills. The ball pushes Bowser back several meters, after which he must then walk back through the "Dark Minions" while dodging or countering their attacks. When near to the battlefield, Dark Bowser again curls up into a spike ball and tries to slam into him from above. Bowser must defend with his shell, then do it again as Dark Bowser prepares the next spike-ball slam. Bowser can avoid the second attack just by walking. When it is his turn, Bowser has to attack his stomach so that he spits up the Dark Star Core and causing Dark Bowser to shrink back to normal size. Bowser must then inhale Dark Fawful, which Dark Bowser will try to counteract it with his own inhaling technique. Fail this part and Bowser will have to do it all over again. Successfully inhaling Dark Fawful pulls him into Bowser's belly, where the Mario Brothers must fight Dark Fawful. If Mario and Luigi fail to defeat Dark Fawful and Dark Star Core within several turns, he will escape and return back into Dark Bowser's body, forcing the process to be repeated. Only upon Dark Fawful's defeat can Bowser give his shadowy doppelganger the final blows. Once defeated, Dark Bowser dissolves, leaving only the Dark Star, which rises into the air and explodes, restoring the Mushroom Kingdom to normal. The "Dark Minions" seen in the Dark Bowser fight in between versions. "Not enough dark power... Power has been drained..."
"Who... Who will give...the dark power... Her... No..."
"Where... Dark power... Being who drains... Where... Where..."
" I have copied all that is you. You are no longer necessary." "The dark power slept so long, and now it wakes... It must be freed... BEHOLD!" "Still here? Has the dark power not yet crushed your puny hopes? Soon this kingdom will vanish along with all who dwell within. And you, too, will sleep eternally in the dark power's embrace!" "Huuh huuh huuh... Haah haah haargh... I have fallen...To come so far...so far...to lose..."
"Dark...Even with the dark power completed...The unthinkable happened..."
Dark Bowser is the third final boss in the Mario & Luigi series that is a different form of Bowser, the first two being Bowletta and Shrowser, and the fourth and fifth being Dreamy Bowser and Shiny RoboBowser. However, he is the only one who is not actually Bowser, because he only looks like Bowser, and is actually the Dark Star. 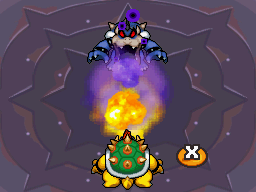 In the original game, Dark Bowser had 1,000 HP, where as in the remake, he has 1,260 HP, making him the second final boss in a remake to have an HP increase, with the first being Cackletta in Mario & Luigi: Superstar Saga + Bowser's Minions. This page was last edited on April 10, 2019, at 14:47.